Your Dogs’ Home Away from Home. - The Crate Escape, Inc.
Only the Best Rest for your Best Friend. Hours of Play for the Busiest of Best Friends. Your Dogs’ Home Away from Home. It’s a Dog’s Life! An active, well socialized, exercised and engaged dog is a happy dog. Dogs get lonely too, and while crates have their place and many stay-at-home-dogs are content and well-adjusted, many long for more companionship and stimulation than our busy lives can always accommodate. That’s where we come in! 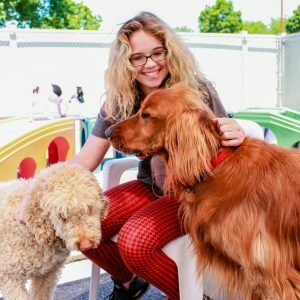 We offer a comprehensive array of pet care services including daycare, lodging, grooming, training and more. Our focus is on providing a positive physical and emotional experience for all dogs in a fun, safe, and clean environment. We limit the number of dogs we care for each day to ensure that all individuals’ needs are attended to. We take the time necessary to make all dogs as comfortable and happy as possible by performing slow and closely monitored introductions. With more than 20 years of experience in the industry, you can rest assured that your dog is treated as part of our family, whether you are away from home for business or pleasure. Give us a call today to learn how we can help your dog – and you – achieve a happier, less stressful and rewarding relationship!